ToyCarsMy breaks its 1st 5,000th record today. Statistic capture from 11th May to 25th July 2008, total 5,072 pageviews have recorded. 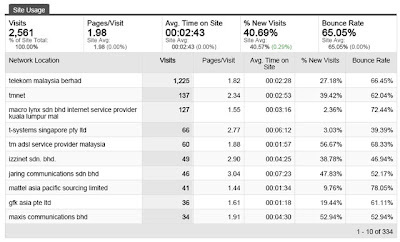 Out of 2,561 visits, 71% visits are from Malaysia follow up by United States at 189 visits, Singapore 154 and Hong Kong 70 visits as major countries. Most of the visits from Malaysia are from Telekom Malaysia, there are subscribers from Macro Lynx, Jaring and Maxis Communication in smaller quantity. 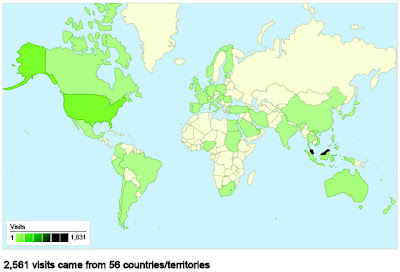 Noticeable, Mattel Asia Pacific Sourcing Limited has contributed 41 visits. 36 visits from GfK where GfK Asia Private Limited is a global research company based in Singapore specialist in retail and technology. Google found ToyCarsMy blog mostly by “Tomica” keyword, which contributed 24% to traffic source.